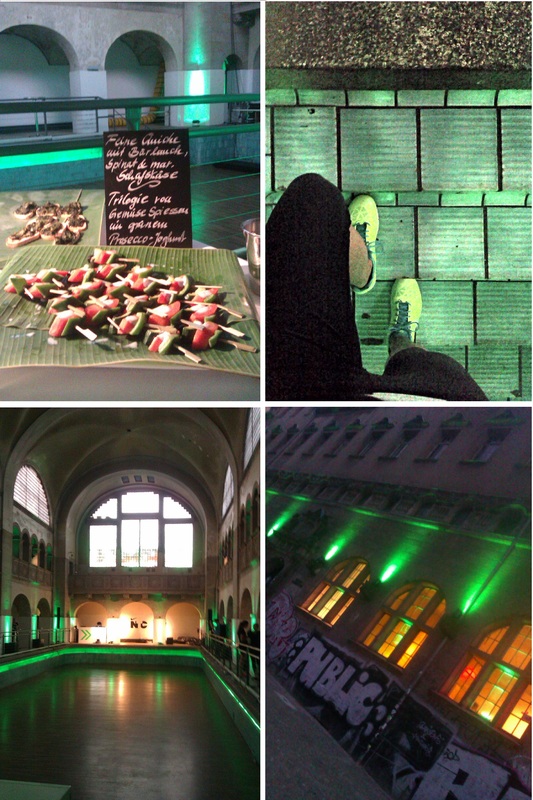 Stadtbad Oderberger Strasse (formerly Stadtbad Prenzlauer Berg) was the location of last night’s free Nike Training Club TRAIN TO RUN event. The old municipal swimming pool managed to escape WWII bombing and continued to be used until the end of 1986, now, the building is under “monument protection”. Incredibly, in 2002, it was purchased by a cooperative of 1,000 members, who intend to restore it and reopen it once again as a community pool, in 2015. On arrival, the building seemed mysterious. Green lights glowed at the windows, a bouncer guarded the door. At the specified entry time, we were allowed into the building, signing ourselves in on i-pads before being handed a mysterious black Nike backpack. Passing under a sign “Ladies macht euch bereit” (Ladies, get ready), I was offered a drink from a tray of tall glasses, loaded with ice and a straw. I was beginning to think I was arriving at a nightclub. I opened the free goodie bag. 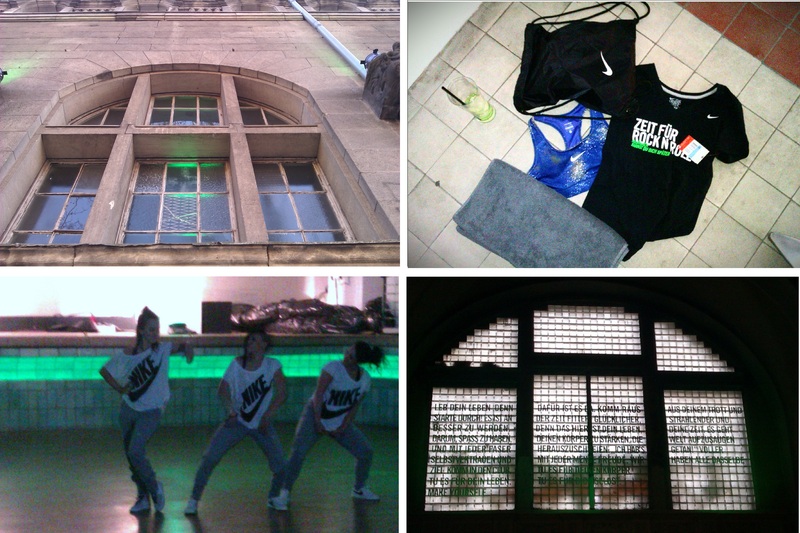 I was impressed – a towel, T-shirt and a sports bra! If that didn’t please me, I could take a pair of trainers to road test during the workout. No choice here, but the flourescent yellow went rather well with the ambient lighting. DJ Grosser was manning the decks from the side of the pool, while 2 instructors put around 50 of us through our paces in a workout designed to get the heart pumping and legs working. Using HITT (High Intensity Training) methods, we worked our way through a series of challenging whole body exercises, with short recoveries to prepare ourselves for each new phase. The latter part of the workout put us into pairs when we jumped, lunged, crunched and high-5’d to the sounds from the DJ. By the end of the workout, we were dripping with sweat, but of course, had our new towels to mop our brows. It was a shame the instructors didn’t manage to include some stretches at the end, or at least talk about the benefit of stretching, but, to be fair, we were all happy in the knowledge we could graze our way through the food provided with a clear conscience! The next Nike event here in Berlin is the “We Own The Night” night run on 24th May 2013 at 20:30 hrs. The route takes you through the streets of the city of Berlin. Other locations are offered in the series, such as London and Amsterdam for example. Nike often run free events like the one I attended. It’s worth checking their website in your local region, or even connect with them on Facebook. That way, you are less likely to miss out on free kit, free workouts, and even free food and drink! Thanks to Nike – I had a great time.